A diary that tracks your level of pain is an indispensable tool to have in your arsenal, for the benefit of your caregiver and yourself. The key is to make sure you record your level of pain and discomfort in a timely manner and describe conditions that may have led up to it, along with all other useful details. This information helps your medical team provide a more personalized effective treatment that will help you cope much better. 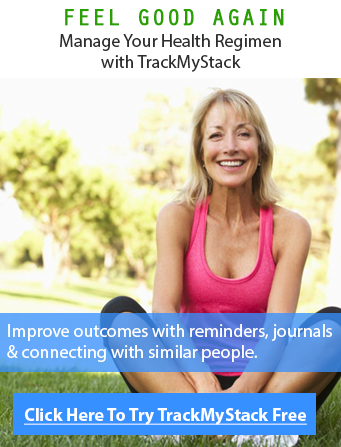 TrackMyStack provides all the tools of a regular pain management diary along with many additional tools to record all details that will help you with a better diagnosis. These tools are optional to use and are provided in additional to basic pain management, all data is safe and securely stored online on our private servers; so it can be accessed from anywhere, without you needing to carry a physical agenda or worrying about losing it. Many patients who don’t originally believe in ‘tracking’ to optimize health always ask ‘the point of tracking everything’ and our answer is always the same. You can not optimize or fix that which you do not actively self-manage. Tracking your pain makes it easier for those taking care of you or yourself to see what is working. When you start taking out treatments that aren’t effective, it will save you time, help you recover faster and potentially even save you money. These all sound like good things to have, wouldn’t you agree? Best of all, we have a community that is here to help you and be your support network if needed. The records you create will help remediate any confusion that may arise or is a result of alternative therapies or medicine as part of your regimen. Maintaining accurate pain records is critical for everyone, if the records you keep are not helpful at the end of the day, there is no point in maintaining them. Keeping a structured journal like the one we provide is critical, you need not write long entries, you can simply record notes, which will suffice. Create a Stack (a routine for a health condition or goal), this will consist of medication, supplements and other treatments you are undertaking to feel better. Track your pain and pain relief efforts whenever you feel like, and record any additional observations of daily living (ODL’s), photos, notes you may have. Repeat steps 1 and 2 as needed. Print out or e-mail your doctor your chronic pain journal so they can either actively monitor it or look at it when you go in for a follow-up. Your caregiver will find this log incredibly useful in determining the efficacy of your treatment. You will feel great knowing you are taking part in helping yourself get better (and potentially quicker too!). 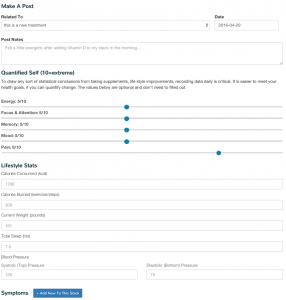 The additional benefits of using TrackMyStack’s platform is the ability to record any side effects felt as part of your regimen and record medicine adherence levels (and refill reminders). This level of detail will help all those managing your health learn about what may be causing your flare-ups, along with if you are on track with your treatment (and if not, hopefully motivate you!). A 0-10 quantified pain scale, very similar to a Visual Analog Scale (VAS). Step 1 – Click “Record an Entry” – to make an entry to your pain journal or log. Step 2 – Fill out as much or as little as you like. It is all managed from 1 screen. In as little as 20 seconds you can keep everyone in the loop on the status of your pain and your progress towards curbing it. Many care givers require you to keep a Pain Management Log, which is a self-assessment log used for keeping track of pain, how long you have felt it, the medication associated to relieve the pain and severity. Additionally our platform can be seen as a Personal Health Record (PHR) which will help you record all pivotal data about your health including but not limited to subjective things such as your mood, anxiety and symptoms that may be associated with pain as part of your Daily Pain Diary. What does it “feel” like? Are there multiple types of pain? The duration of your pain. What did the pain prevent me from doing? What medicine or compound was taken at which time. When you felt your pain (day, night, all day). Any symptoms or side effects related to your pain. Your total adherence levels to your stack/regimen. Graphs & charts displaying time and health or just pain over time. The level of pain from a scale of 1 to 10. If the pain comes and goes (based on pattern of entry). If the pain interrupted your sleep, as you can also record how many hours you slept the night before. If the pain is getting worse or not. If it affected your appetite or not (as part of total calories consumed). What may be making it worse. The history of everything you have tried and when to manage your pain. The effectiveness of the medicine you are taking to manage your pain and the level of relief. Your Mood, Memory, Anxiety, Calories, Sleep and various other metrics that may correlate to your pain. Pain Charts generated automatically using TrackMyStack. Sign up now and manage your pain instantly. Shingles, Cluster Headaches, Frozen shoulder, Broken bones, Complex Regional Pain Syndrome (CRPS), Heart attack, Slipped Disc, Cancer, Arthritis, Migraine, Sciatica, Kidney stones, Appendicitis, Trigeminal neuralgia, Pancreatitis, Gout, Endometriosis, Stomach ulcer, Chronic Neuropathy, Fibromyalgia, Rheumatism, PMS, Pain after a surgery/operation. There are well over 300 other chronic health conditions and symptoms that may be managed on TrackMyStack using multiple stacks (diaries). The one key take away is to track your health daily or multiple times daily, the data will not be conclusive if entered sporadically. Our professional pain tracker web app is mobile responsive, so you may access us via Android or iOS (a dedicated app is in the works for iPad and iPhone! but our website loads perfectly on any mobile device as of now through a browser). 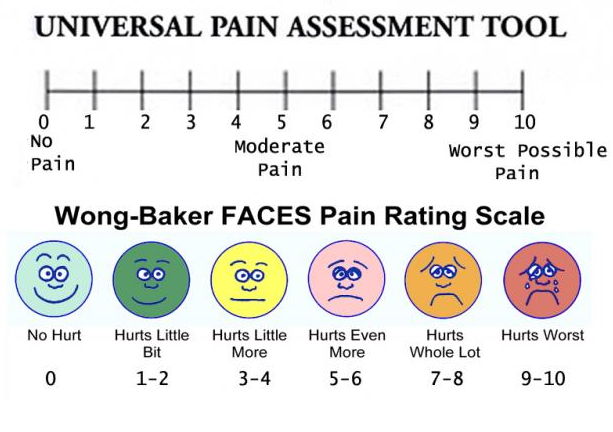 There are many scales to measure pain, some prefer, the Wong-Baker FACES pain Rating Scale, but we use a “0-10 Pain Scale” where 0 is No Pain. If you are ready to use a modern option to record your pain (rather than a physical pain assessment card or printable worksheet) and improve your treatment (possibly) from managing your own health, click here to get started right away and remember to maintain a good healthy attitude towards your health goal.